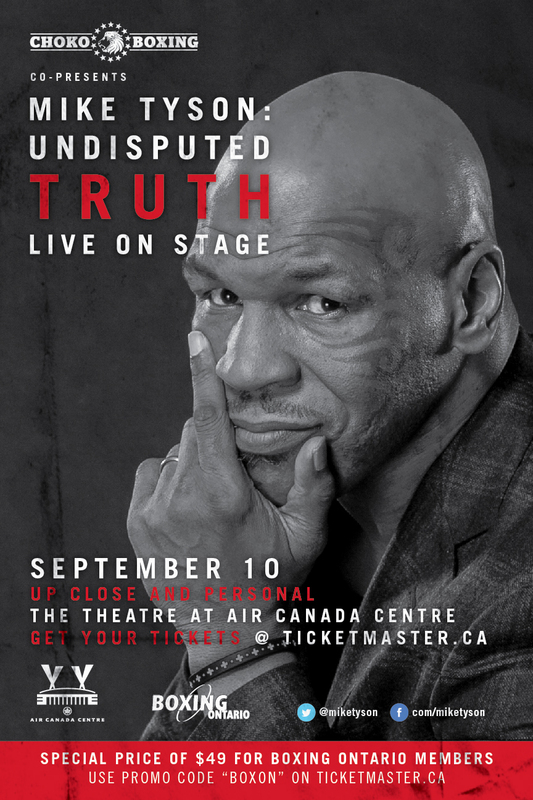 On Wednesday September 10, 2014 one of the biggest names in boxing will be coming to Toronto to share his stories, experiences, and his life! Maple Leaf Sport and Entertainment (MLSE) has stepped up to support amateur boxing and our athletes specifically by offering a discounted ticket price to all those who utilize our special Boxing Ontario code “BOXON”. When ticket buyers use this code a portion of ticket sales will go directly back to our athletes training fund which will help our team heading into the National Championships this October 29 – November 1, 2014. That ticket price is also more than 25% off the cheapest ticket price available to the public! 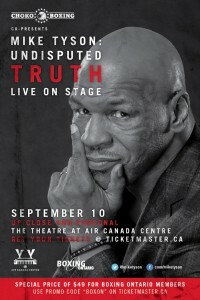 Mike Tyson is bringing his unique & successful show to Toronto, wherein he plays himself and tells it all, in his inimitable way. So use the code and come down and watch Iron Mike. It’s a show you don’t want miss! Use the promo code “BOXON” on the link below!